I am trying to install the software for my Canon printer on to my husband’s Windows 7 PC. We have a software install CD that is compatible with Mac and Windows, however he has one of those new-fangled machines without an optical drive. We looked online for the appropriate software but couldn’t find the right combination of software and drivers that worked. So, I thought I could try to transfer or “burn” the CD to a USB thumb drive on my Mac (which still has the optical drive). No matter what I do, I have only been able to transfer the Mac specific files onto the thumb drive. Is there any way to access that Windows partition of the disc from my Mac, to be able to transfer those files to a different medium? Insert the CD into your Mac’s media drive and then launch Disk Utility (/Applications/Utilities). When Disk Utility launches you’ll see the CD listed in the left-side of the Disk Utility window. Most likely that CD will have more than one listing—the name of your media drive (SuperDrive, for example) followed by Session 1 and then the name of the CD. Select the first of these names—SuperDrive, in our example. Click the New Image button at the top of the window and in the resulting sheet choose DVD/CD Master from the Image Format pop-up menu. In the Save As field give your image an intuitive name such as Canonprinter and click Save. 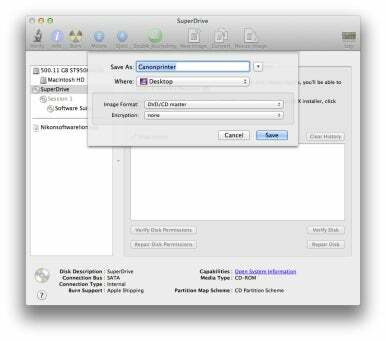 Disk Utility will now create a disk image called Canonprinter.cdr. Copy that image to your USB thumb drive, move the thumb drive to the PC, and copy the disk image to the PC. Remove the .cdr extension and replace it with .iso. (So, in our example, the disk image would now be called Canonprinter.iso.) On the PC download a copy of SlySoft’s free Virtual CloneDrive. This is a utility that allows you to mount ISO images as if they were hard drives or removable media. Double-click on the Canonprinter.iso file and an AutoPlay window appears. Choose the Open Folder to View Files option. You should see the Windows installation files for your printer. Install them just as you would from the CD.